Just as I wanted. My first post of 2016 had to be a travel post. And what is more exciting? 2016 started with a travel trip. I just want to travel more than I do. I am not a travel enthusiast but I just want to visit places. Why not? Before anything, check out the 5 best things to do in Jaipur here! Jaipur just happened. I wanted to go somewhere because I did not want to waste my year end holidays. I was thinking of some colder places to witness snow and snowfall. But then, no matter how much I wanted that, I am just too intimidated by cold. So, I decided to skip it. Also, I wanted to reach somewhere in 6-7 hours from Delhi and the colder places were way too far than that. 1. It is a perfect weekend getaway. You won't need more than three days to cover this place. 2. The perfect time to visit is probably before the onset of Indian summers. When I went, that is January, even though I was wearing two layers in Delhi, Jaipur was hotter and required no sweater. But yes, carry a light jacket or sweater for the evenings. 3. This place is very, very reachable by train, roads or planes. I traveled from Delhi. It takes hardly five hours by roads. If driving, you can follow the following route. However, the route is not pleasurable for self driving. I traveled by Volvo bus run by Rajasthan State Road Transport Cooperation (RSRTC). I was scared in the beginning but it turned out too well. In fact this is pretty hassle - free. Book your tickets via the app. Take the bus from Bikaner House in Delhi or from IFFCO Chowk in Gurgaon and just relax. I have heard a lot about the train from Delhi to Jaipur too. Had my trip was not an impromptu one, I would have travelled by train only. Plan your trip well in advance. Decide what all you have to see, where do you wish to stay, the lodging distance from the places you want to visit and the bus/train station, book everything in advance - these are the few tips when you decide to go during the peak season. There was so much crowd that I was so glad that my trip was planned well. My trip started on 1st January 2016, midnight. I took the bus from Bikaner House at 23:59. I am an early sleeper and riser, so this was pretty difficult. More difficult was to sit quietly throughout the journey because it was night time and everyone was sleeping. Not the most comfortable journey, but yes I reached on time. I touched Jaipur Sindhi Camp Bus Station at around five in the morning. It was cold but not freezing. When you are a girl traveler, you have to be sure about your staying arrangements. I was glad I had booked a good hotel via Oyo. I was never convinced with the Oyo services. I booked this one after a lot of research and it turned out too good. I just informed them that I will be checking in late at night so that they did not cancel my reservation. Also, the hotel, Hotel Galaxy Inn, was an absolute delight because of the good services and hygiene. I slept for good 4 hours, had my breakfast and checked-out. I was helped by the receptionist at the hotel to find a good auto-driver for sight-seeing. I had planned to see the forts at the outskirts of Jaipur. I had already seen the city during my previous visit - Jantar Mantar, Hawa Mahal, the royal theatre called Raj Mandir- were nowhere in my list this time. Secondly, I love forts. I love them for their altitude and the view from the top. I had planned to roam around the whole day and then come back in the evening for a relaxing night. I am sorry but I had to start this photo journey of Jaipur with a selfie. So much of self love! The auto-driver was an audio Wikipedia. He started narrating the history of Jaipur while we traveled from the city towards the forts. On the way, we came across the Jal Mahal. I had already read a lot about it before going there. And yes, I was indeed mesmerized by the beauty. Jaipur, you really need to maintain and safeguard your heritage. No matter how beautiful but this place was a mess. Yes, it is absolutely beautiful. People, specially couples, think that they want a Taj Mahal made. But I want a Jal Mahal being made. In the heart of the city yet so far. You can't reach out to people and vice versa. Exactly how a wall built around the heart world but you can at least enjoy the beauty that lies outside your wall. Built inside the Man Singh Lake, when you see the Aravalis giving this area an outline, you are definitely transported to a different world. A true beauty. The next destination was the Nahargarh Fort. I was so glad I did not take my car because I couldn't have drove up till there. I had know idea about that tricky path. The drive uphill(and downhill) is fun. The view is fun. The jungles around are fun. Damn, this fort definitely served the purpose! This fort became much popular after the shooting of the movie Rand De Basanti. When you can't convey what you want to the photographer. Anyhow, this is the best I could get. The seven palaces of the seven queens looked pretty okay. It is then that I realized that Mughal architecture is more royal and humongous than ours. I don't want to compare Delhi and Agra with Jaipur at all! One of the seven palaces. According to the legends, Nahar Singh's spirit, the then king who died, wouldn't let the construction of this fort (then known as Sudarshangarh) complete. So, to pacify the spirit a temple was built at the top and thus the fort derived its present name. And the place of pretty and the photographs were coming out to be really amazing and I was totally in love with my pink sweater, that wise I am sharing some of my self love too. Thanks for bearing with me. Yes, I am tired with all the walking with my heavy bag. But backpackers swag. However, I was a backpacker only during the day time because after the journey I decided to go luxurious! The view from the top of this fort is good. It looks directly above the Pink City of Jaipur. If only my camera could capture the real beauty. Then the auto-driver proceeded towards Jaigarh fort. Please plan your route according to the location of these forts. Nahargarh and Jaigarh are on the same way while Amber Fort is in the opposite direction. The main attraction of Jaigarh Fort is the world's largest canon on wheels. This canon is called Jaivan and it is massive. Like MASSIVE. By the time this was finished, I was famished. I had my lunch at a restaurant situated in the fort itself. They claimed that it was started by a person who carried the bloodline of the cooks from the royal kitchen. I have no idea if that was true but the food was good. The next in the list was Amber Fort. All right, if you are always in awe of forts, this one is definitely going to catch your attention and love. Jaipur, if only you could maintain this a li'l bit more. This fort overlooks the Maota lake, where I actually caught some fishermen fishing. The fort looks huge. And it is huge! The view from the top is dreamy and beautiful.Although the pictures on the internet is full of greenery but it is all barren. I want to believe its seasonal! I just loved this place and the view. Once you reach the top, the palaces, the gardens and everything else is just mesmerizing. However, please don't go during a busy weekend like I did. You will not be able to enjoy the beauty thoroughly. After having a good view of the city from above, I headed to the Ramakrishna Mission. Because I have been initiated and I decided it somewhere in my head that I will go the Mission of every place that I go, if possible. And largely because my mother made it sure that I do visit it by reminding me every hour before my journey started. I love the missions. They are the most peaceful places on this earth. After spending some good minutes there, I started towards my hotel for the 2nd January night. The hotel booked was The Fern which was of course pre-booked using various new year deals from different travel agent's website. I was so glad that this hotel was chosen. It is just perfect! After a long day full of walking and running around and a overnight bus journey, I believed a li'l treat was needed. After all this was a weekend "getaway". After freshening up a li'l bit, for dinner Chokhi Dhani was decided. Of course you have the village experience by this chain around Delhi too but this one couldn't be missed. However, once there, I realized that new year weekend has screwed up this place completely. I decided to cross the road and go to the copy of this place called Pride Amber Vilas. Though it was not full but the calmness of the place amidst the Jaipur crowd and traffic allured me to have a quiet dinner at the beautiful restaurant. After having a hearty meal I came back to the hotel. One heads up, don't except lots of cabs around. Ola had shut down at 9 pm only. DO make your arrangements. You can ask your hotel to provide you with the cab. The night was spent sitting on the roof top along side the pool, enjoying the light winter breeze, gazing at the stars and praying for a new beginning with the new year. After a hearty breakfast and hearty might be an understatement because it was too good and too yummy, I headed back to the Sindhi Camp Bus Station for my Volvo Bus. The bus was pre-booked. Jaipur as a city and a tourist spot has a lot to offer in the name of sightseeing. 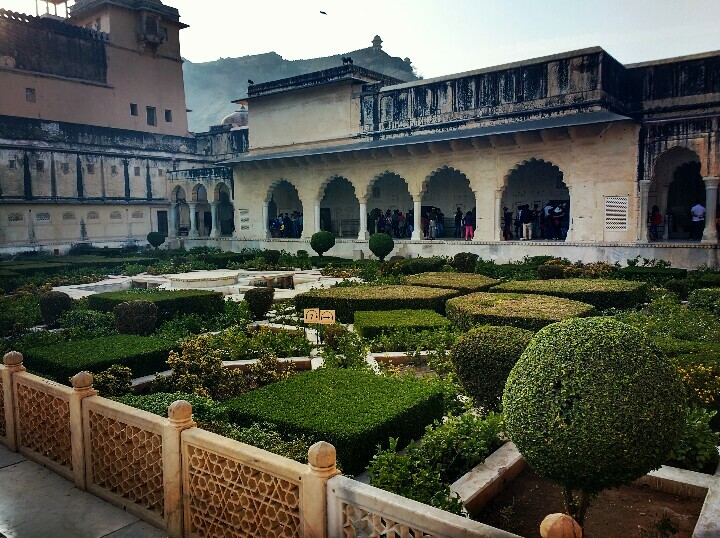 The Famous Amber Fort is not to be missed at all and other Palaces like the City Palace Jaipur, HawaMahal, Jaigarh Fort known as CheelkaTeela etc. Jaipur is all time favorite among travelers and tourists for many things it offers. Your capture of Jaigarh from Amer Maota is stunning. I didn't understand why you were afraid in traveling via Volvo? Thank you for the compliments. And I totally agree that Jaipur is traveler's paradise. Since it was my first time alone, I was afraid in general. I would have been equally afraid to go via flight or train!